Glitter, glamour and a gong or two at The Golden Globes. handed out by the Hollywood Foreign Press Association. 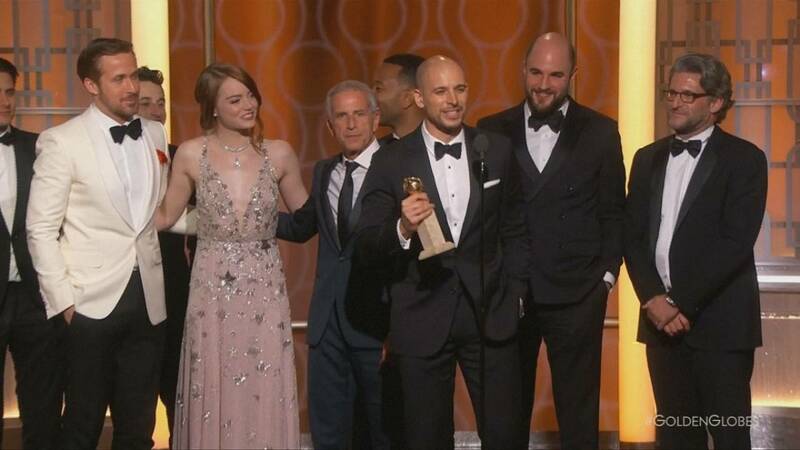 The whimsical musical ‘La La Land’ broke the record books with its haul of seven prizes – the highest number of Golden Globes for any film including best actor and actress in the comedy section. The movie had been heavily tipped to dominate the night in Los Angeles. Not so the winner of the best drama movie, ‘Moonlight’. It is a timeless story of human connection and self-discovery, and chronicles the life of a young black man from childhood to adulthood as he struggles to find his place in the world while growing up in a rough neighborhood of Miami. The independent film, directed by Barry Jenkins had been shut out of every other category. And on the theme of surprises the winner of the best actress in the drama category was also unexpected., Isabelle Huppert. The French actress won it for her role in the movie ‘Elle’. Many in the audience had expected the statue to go to Natalie Portman for her portrayal of Jackie Kennedy Onassis. In an emotional acceptance speech Huppert celebrated diversity in cinema. “There are people from all over the world here in this room from China to the Arabic world, from America to Europe. Do not expect cinema to set up walls and borders. Thank you. Thank you,” she told the audience. The 63-year-old earned the nod for her portrayal of Michèle Leblanc, a businesswoman who is attacked in her home by a masked assailant and plots revenge. The dark psychological thriller also won the Golden Globe for best foreign language film. Casey Affleck, won best drama actor for his role as a man riven by grief. in ‘Manchester by the Sea’. It was the actor’s first Golden Globe. The award for the best supporting actress went to Viola Davis. “This is my fifth nomination. I took all the pictures, went to the luncheon…but it’s right on time!” she said. In the film Davis plays the wife of a former baseball player who struggles to provide for his family. The film is directed by Denzel Washington who plays Davis’ husband. British actor Aaron Taylor-Johnson took home the award for best supporting actor for for his role of an American redneck killer in Tom Ford’s “Nocturnal Animals”. He has revealed he needed therapy to fully shake off the dark effects of preparing for this demanding role. Finally, Meryl Streep stole the show accepting the Cecil B. DeMille Award at the ceremony and used her speech to slam President-elect Donald Trump without ever mentioning him by name.